Carey has been living in a camper in the middle of the woods for as long as she can remember; bringing up her little sister, Jenessa, in the shadow of her addict mother. Her mother tells her they had to run from their abusive father and the woods are the only safe place for them. When her mother is gone for longer than her normal trips away, Carey starts to worry but is certain she’ll come back. But then two strangers approach them, strangers who promise to take them away. Promise them a better life. Written in first person narrative, Carey starts off in a southern accent but makes a conscious decision to improve her speech when she joins the rest of the world. This means that the writing style changes a few chapters in (so don’t make your mind up from a sample, as accented speech can often be a struggle to read). The two girls are well educated, but there are a lot of things that we take for granted that they have only read about and there some wonderful scenes of amazement as they become reintegrated into modern life. Yet there is also an awful lot to be scared of; from surviving high school to hiding the truth. It's also a shocking reminder of the poverty that some families live in, whatever their circumstances. I know that Carey has had things bad in the past and deserved good to happen to her now, but really, I felt her new life was a little too good to be true. Her new mother doesn’t bat an eyelid at spending hundreds on a new wardrobe, both children score above average in their learning assessments and the whole family is incredibly patient and understanding. It is often a fault of YA that the adult characters aren’t multi-faceted; they’re either without flaws or plain evil. Delaney is a breath of fresh air in this respect, as she might seem mean but her reactions to an intruder in her life are natural. The dark underbelly of the story is what drives it on. There are enough clues given to work out what happened to them in the woods but it’s about Carey coming to terms with it, getting to the point where she’s willing to admit and accept. 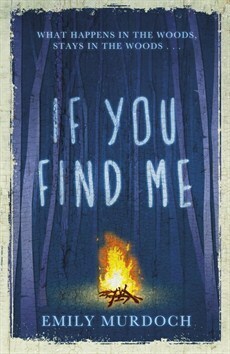 If You Find Me is published by Indigo, an imprint of Orion, and will be available from 2nd May in hardback and ebook formats. Thanks go to the publisher for providing a copy for review. Wow, this one sounds oddly dark. Shall have to track down a copy sometime. Hopefully the library gets it in.